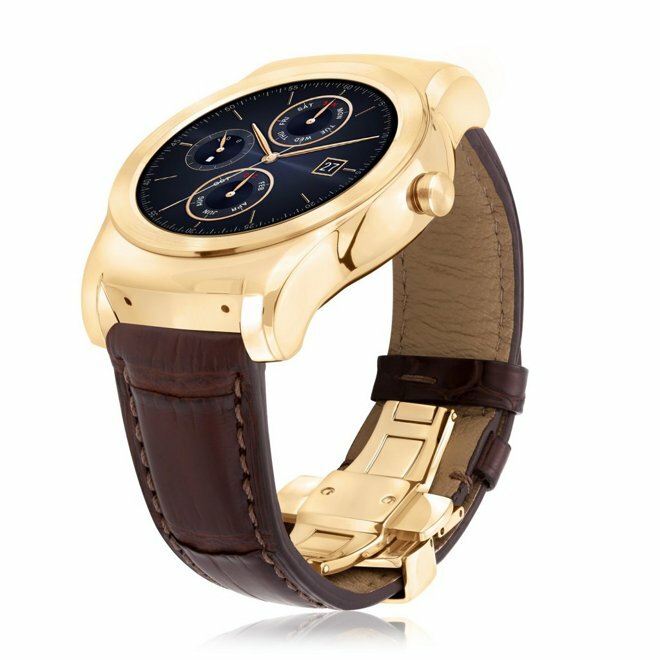 South Korean electronics firm LG on Monday unveiled an upscale addition to its Urbane smartwatch lineup, adopting a 23-karat gold case and hardware along with an alligator strap in a new $1,200 limited edition offering. The gold case sports a piano-lacquer gloss finish, and the band features a matching gold deployment clasp. LG says that the new luxury smartwatch is "designed with a specific wearer in mind," though that wearer is neither named nor described. LG created the watch in tandem with American firm REEDS Jewelers, which will also handle sales of the device in the U.S. Just 500 will be made, each with a unique serial number. Technologically, there do not appear to be any differences between the Urbane Luxe and the standard Android Wear-based Urbane line. Those devices feature a round 1.3-inch OLED display, 512 megabytes of RAM, a built-in 1.2 gigahertz quad-core processor, and IP67 dust and water resistance. "Wearable devices shouldn't be thought of as an extension of one's smartphone but an extension of oneself," LG marketing executive Chris Yie said in a release. "This blending of craftsmanship and technology is a natural evolution of the smartwatch, which is becoming more of a lifestyle accessory than a piece of hardware. We think this is a good direction for wearables and we want to encourage this transformation." The LG Watch Urbane Luxe will be available for approximately $1,200 beginning in October.